The skill of surfing is a gift that keeps on giving - and there's few better ways to help someone get started than a surfing lesson on the Sunshine Coast. With its wide array of lovely beaches and beautiful waters, it's the perfect destination to join a class, hit the waters, and feel on top of the world. Gift vouchers are available for both beginner's group lessons and private individual tuition, enabling you to choose whichever kind of class is best suited to their temperament and ability level. Taking place at Coolum Beach, these surfing lessons are ideal for anyone who either lives on the Sunshine Coast or are going to be travelling there in the near future. Grab a gift voucher from the options below and give them a chance at one of the most rewarding experiences to be had on the water. Get someone started down the path of the thrill of surfing with a gift voucher for a beginner's group less on at Coolum Beach on the Sunshine Coast. 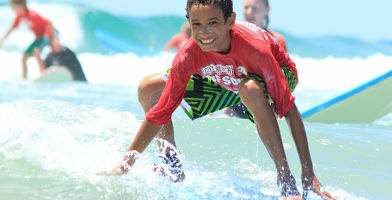 This Sunshine Coast surfing lesson gift voucher provides the highest level of personal attention, with a 1.5 hour private lesson on lovely Coolum Beach.